One of my space geek Facebook friends has recently taken it to the next level. Remco Timmerman put together a poster on social media and the space industry. If my tons of NASA posts haven't let you know already, social media has played a huge impact in furthering the public impact of space research. 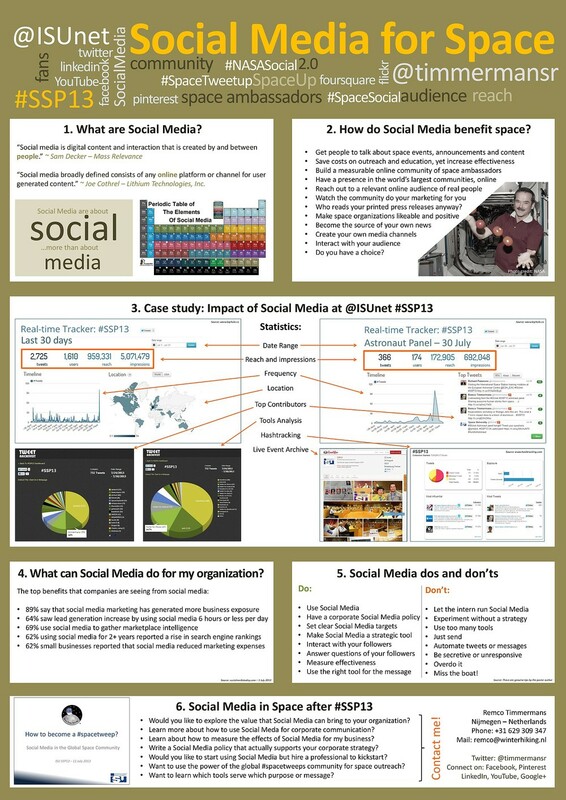 Remco's poster, "Social Media for Space", was presented at the International Space University ISU alumni weekend poster session last weekend. According to the ISU Facebook page, "ISU provides an interdisciplinary education in the context of an intercultural and international environment to support the development of future leaders." They always have a great YouTube channel chock full of space stuff. Check out the poster below. A higher res version is available for download here.